High Voltage Tattoo is a graphic perspective on today’s global tattoo culture by Kat Von D, star of The Learning Channel’s L.A. Ink and one of the most talented and popular artists working today. Designed in a style that is reminiscent of a handmade Gothic journal with its red padded cover, ornate typography, and parchmentlike pages, it throws the door wide open to tattooing culture in the way only an insider like Kat can. Voltage Tattoo traces Kat’s career as an artist, from early childhood influences to recent work, along with examples of what inspires her, information about the show and her shop, her sketches, and personal tattoos. The book goes deep into tattoo process and culture: readers can see up close the pigments, the tools, and the making of complex, even collaborative, tattoos. With a foreword by Mötley Crüe’s Nikki Sixx, the book features images and stories about celebrities, rockers, pro skaters, and everyday citizens, including Slayer’s Kerry King, Anthrax’s Scott Ian, Margaret Cho, Jackass’ Bam Margera, David Letterman, and many others. It profiles and showcases the work of artists Kat has selected from all over the world, her interviews with people who have compelling tattoos and stories, and amazing images of extraordinary tattoo work. Numerous portfolios throughout the book showcase a range of relevant subjects, from the black and gray portrait work for which Kat is famous to a popular tattoo theme, such as the rose or biblical images. There is a knockout ten-page full-body spread of Kat—clad in a yellow bikini and seven-inch, rhinestone-studded red stilettos—that catalogs in detail all her personal tattoos on her front, back, left, and right sides—even her hands and head. 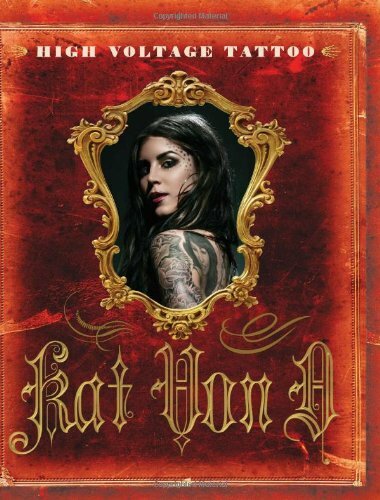 Kat Von D is a world-renowned tattoo artist. The owner of High Voltage Tattoo and Wonderland Gallery and the star of The Learning Channel’s hit global show, LA Ink, which ran for five years, she is the author of two New York Times bestsellers, High Voltage Tattoo and The Tattoo Chronicles. She continues to add to her spectrum of passions through numerous creative outlets, including a makeup line with Sephora as well as an eponymous clothing line. She also set the Guinness World Record for doing the most tattoos in a twenty-four period in 2007. Her tattoo shop and art gallery are located in West Hollywood, where she happily resides. This entry was posted in reviews and tagged Guinness World Record, High Voltage Tattoo, Kat Von D, LA Ink, Mötley Crüe, Nikki Sixx, Tattoo, Tattoo Chronicles. Bookmark the permalink.